Bharadvaja's twist, or Bharadvajasana in Sanskrit, is a challenging seated twist that improves spinal flexibility. There are several variations of the pose. 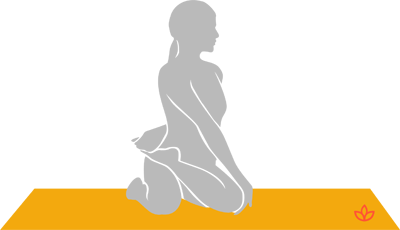 In the most basic, the legs are folded to one side and the torso is rotated in the opposite direction. The outside arm reaches behind the back to clasp the other arm. From thunderbolt pose, shift the hips to the right. Rest the right foot on the arch of the left. Tuck the left hand under the right thigh. Exhale and twist to the right. Reach the right arm behind and grasp the left arm.